We all know very well that making a good fortune in YouTube is not so simple, and the usual thing is that the most famous YouTubers not only earn income from the clicks and visits, as they also establish direct collaboration with brands, form a part of programs of affiliates and goes to events as well among others. 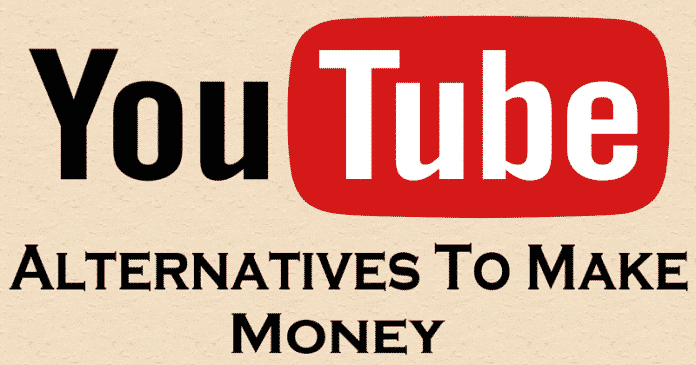 Hence, today in this awesome article we will show you all an amazing list in which we will present 10 best YouTube alternatives to earn money. Gathering a good fortune in YouTube is not so simple, and the usual thing is that the most famous YouTubers not only earn income from the clicks and visits, as they also establish direct collaboration with brands, form a part of programs of affiliates and goes to events as well among others. However, the most interesting thing about the new YouTube Partners Program is that it now requires at least 1000 subscribers or members simply to monetize the videos and 4000 hours of playback in the last twelve months. Even this same criteria will also be applied on the channels that are already monetizing their activity with advertising. Another requirement is to have a Google Ads account linked to the Youtube channel, from which you can select yourself the format of ads you show-sponsored cards, overlapping ads, graphic ads, and much more. And the fact is that it is not so easy to accumulate much money thanks to this monetization process, whose response from the platform is usually slow and whose waiting time you can reduce by referencing the sources of your content, trying to create original videos, never resort to duplicate content and use legitimate form material with copyrights that do not violate the rights of the owners. So, now if you are really tired of YouTube and now you want to find best alternatives to make money with your videos then don’t worry about that, as today in this awesome article, we will show you an awesome list in which we will present 10 best YouTube alternatives to earn money. So, now without wasting much time let’s get started and explore the whole list mentioned below. DTube is a decentralized platform for video transmission linked to Steemit, which at the moment doesn’t have lots of features, but still, it is one of the best alternatives. As its system simply allows to earn real money or cryptocurrencies through accumulated votes. Hence, it is an alternative to YouTube that could simply gain weight over the next few years and may beat the tech giant Google’s giant video platform, of course, YouTube. The well-known BridTV is another great alternative for YouTube and as it is one of best online video monetization platform that simply allows small and large companies to host their own videos, code and earn money. As on this platform, of course, I am talking about none other than BridTV the content publishers can simply earn 60% of advertising revenue while BridTV only keeps 40% of revenue earned by its publishers. Currently, it is one of the best known and most popular micromanagement platforms for content creators, writers, and YouTubers who prefer to earn money through their viewers and not so much through advertising. This well-known video platform was founded in the United States, San Francisco. But, the most interesting thing about this platform is that its monthly recurring micropayments simply let its many creators make their projects self-sufficient. However, the biggest complaint is that payments are received through Paypal which charges a lot for exchanging or conversion of currencies. With a not insignificant figure of 300 million monthly users, this well-known video platform born fifteen years ago simply to upload and store digital videos focuses on creative content. So, if you want to use Vimeo to monetize your creations you can simply choose two alternatives: the “Tip jar” option, with which it is possible to receive direct donations from PRO users, while “Pay to view” demand that users pay a certain amount of money for your content. In 2013, the website introduced the “Vimeo on demand” tool, the section in which you must go as a content creator simply to sell videos on Vimeo. Since its inception along with the well-known giant video platform, of course, Vimeo has been one of the main competitors of YouTube, if you need a powerful content aggregator, this is your option, being able to tag the videos and get ad revenue. The monetization system is similar to the tech giant Google’s well-known giant video platform, of course, YouTube. Here there is room for more cinematographic and cultural content such as short films since videos of up to one hour in length are allowed by the platform. Although you probably know more about Flickr because of its importance for photographers (both amateur and professional) in this platform you can publish long photos, a name that designates short videos, which could not be more than ninety seconds. That’s it, as you can sell your content, labeled and with the watermark to the platform itself. Another very interesting platform for digital video that simply offers a free service for users and other companies pay for promotional videos. As users earn money through advertising and introduction videos. So, if you want to earn then you must have to create an account and simply start your adventure within this platform. This is undoubtedly one of the most famous alternatives to Youtube at the moment for the monetization of video contents, which can be done essentially through two channels: through subscribers and donations. As content creators can earn money through agreements with sponsors, provided that the content meets the requirements and arouses interest. Hence, it is a great nest of content for gamers. The social network giant Facebook simply offers all its video creators 55% of its ad revenue in their program. Hence, the social network giant Facebook has announced a new content creator program that offers exclusive tools for creating and promoting streaming videos. And not only that even the social network giant Facebook also has a new section on its desktop website which is known as “Facebook for Creators”, where content creators can get tips to improve their video-making skills so, that the can better connect with their viewers simply by using the social network giant Facebook’s new features. Basically, the AdRev is a multichannel network which has usual characteristics and large audio database which simply denotes a large database of completely free music to use for all your videos. And not only that along with all these features this well-known platform also offers a lot of tools for video optimization and promotion as well. As this platform itself claims that they can easily maximize the revenue, protect and monitor the content on several video platforms as well. All these are the 10 best YouTube alternatives to earn money that are available on the internet. However, it is worth to note that there are lots of other similar services are also available on the internet, but we have listed only the best ones for you all. So, what do you think about this? Simply share all your views and thoughts in the comment section below.